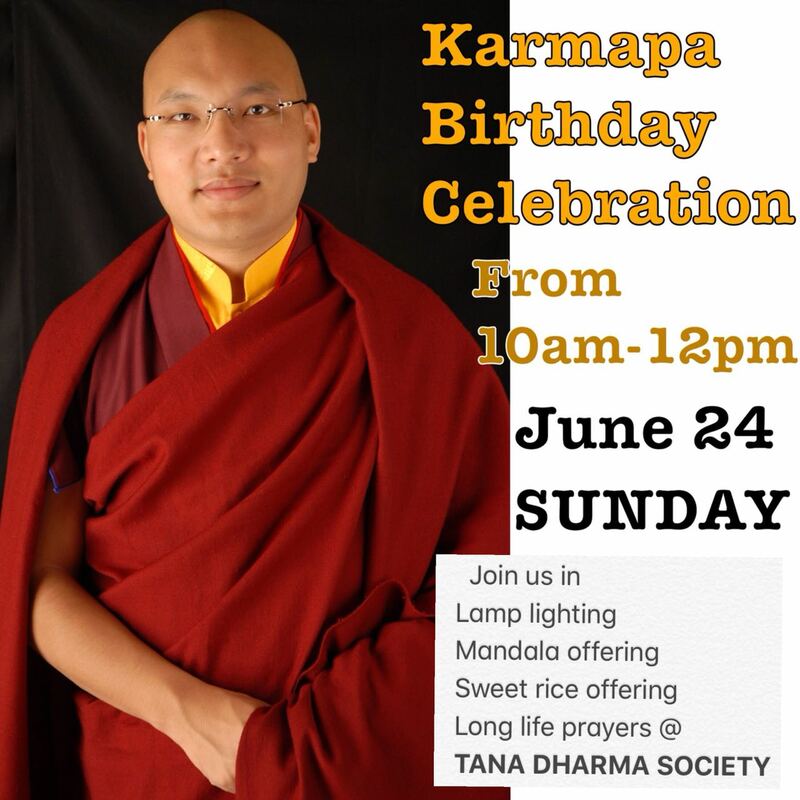 Khenpo Karma Sopa was born in 1983 and took refuge under the previous Dilyak Dabzang Rinpoche who gave him the name Karma Sopa. From an early age he entered into Tana Monastery, Tibet, to study reading, writing and memorizing text for which he obtained high honors. In 2001 he entered into Sherabling Shedra (Institute for Buddhist higher study) in India where he studied all the Buddhist Philosophy, Literature, Poetry, Grammar and Buddhist History, etc. After studying nine years he graduated from Shedra, top in all the exams. According to the Shedra rule, he offered his service to Sherabling for three years after completing his nine years’ studies. In that period, he was sent to Tana Monastery to teach the Tana Monks for one year and he taught in Sherabling Shedra itself for two years. In 2017 he was appointed and enthroned as Khenpo in front of hundreds of Monks by HH Kenting Tai Situ Rinpoche. Besides the Shedra studies he has received many Empowerment and Meditation instructions from HH Tai Situ Rinpoche, Sangye Nyenpa Rinpoche and Yongey Mingyur Rinpoche including Empowerment and Transmission of Five Great Treasures, 13 Marpa’s style of Tantric practice, Tripitaka, Mahamudra Meditation and many others. Khenpo Karma Sopa is fully ordained by HH Tai Situ Rinpoche. At present he is working in Sherabling to create the Buddhist Monlam Dictionary under the direction of HH Tai Situ Rinpoche. Both the pujas help to prevent the obstacles from the past year from carrying forward into the New Year. It will specially protect us from powerful demons. 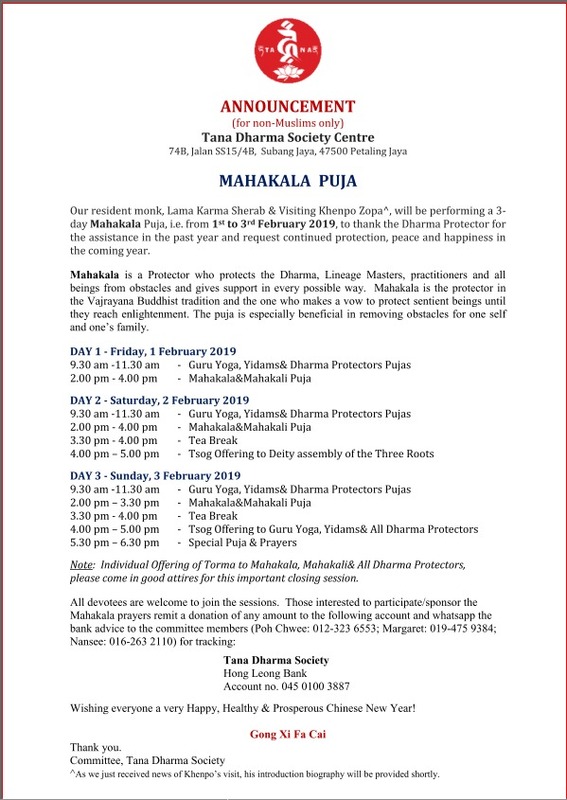 Please read the brief write-up about the pujas below. You may sponsor both the pujas by making a donation of any amount. with towel/slippers and other requisites. The robes can be sponsored at RM250/set. If you wish to undertake this meritorious deed, please indicate the same in your remittance. You may sponsor any number of sets as you wish. The young lamas, about 50 of them, will wear these new robes on Lorsar day to welcome the New Year. Kindly email your remittance advice to Sis Poh Chwee at pohchwee@hotmail.com, Sis Margaret Lim at margaret.limyk@yahoo.com or Sis Yeo Nan See at nansee.yeo@gmail.com after you have remitted your contribution to enable them to track your contributions. Please do not omit to email the names of participants and their contributions as we will be compiling them to be sent to the Monastery by 28 December, 2018. A Puja is a Buddhist ceremony. Vajrakilaya is Buddha manifesting particularly the enlightened qualities of the complete reversal & utter destruction of ignorance and of negativity, which are synonymous & synchronous with the complete expansion and revelation of wisdom and compassion that is Buddha. Vajrakilaya was one of the main practices that Padmasambhava transmitted to his students. The practice of Vajrakilaya has great significance in that it is what Padmasambhava last performed in Nepal before his triumphant arrival and victorious introduction of Buddhism from India to Tibet in the 8th Century AD. Following the example of Guru Padmasambhava and many superb lineage masters, we perform Vajrakilaya to overcome outer, inner, and secret obstacles to Dharma practice and activity as well worldly activities. Crazy Wisdom Vajra”, a wrathful manifestation of Padmasambhava and a subduer of demons. Guru Padma arose in the wrathful form of Dorje Drolod in the famous Tagstang or Tiger’s Nest Cave in Bhutan to subdue the negative and demonic forces of these degenerate times. Ferocious in expression, amidst a mass of primordial wisdom fire, he stands upon the back of a pregnant tigress who is the wrathful form of his Wisdom Consort of enlightened activity, Tashi Kye Dren, whose ferocity is unpredictable and wild. Dressed in a robe of brocade, his hair is red and curly, he has an overbite and fangs and wears a garland of severed heads representing the cutting of the 52 levels of dualistic mental-events. In his right hand he holds aloft a vajra emitting lightning bolts, and in his left a kila-phurba, a three-sided ritual dagger which severs the three poisons that are the source of all suffering. The ferocious expression he wears while riding a pregnant tigress who is munching on a corpse makes for a menacing figure. His body is dark brown and surrounded by a halo of flames. Thank you for your participation and we would like to wish you all a very spiritually fulfilling New Year. May 2018 be spiritually enlightening, better, brighter and more prosperous year. Learn how to develop Bodhichita, how it uplift us in the most difficult times in our life and how essential it is for one’s enlightenment. Ven Tana Tulku Rinpoche observed that there are many people who are sick, hence out of compassion Rinpoche is doing this puja to benefit many people. Please contact sis Poh Chwee/Sis Nansee to register the above.